Why make art projects with ordinary construction paper when you can use neon paper and lots of sparkly stickers? Put on your sunglasses and watch campers shine with creativity using these bright-colored supplies. 1. Neon Paper Sculpture: Cut neon paper into various length strips from 3-8 inches long. The width can vary from 1-4 inches. Give each child a piece of bright-colored paper and 8-10 paper strips. Children can decorate the strips with shiny stickers and sequins. Show children how to make a 1" bend at the end of each paper strip. Once they understand the concept, they can construct this sculpture on their own. Dab glue on each end of the paper fold. Attach to the construction paper, making an arch. Now continue adding glue to the folded ends and interconnecting the strips on the sculpture. Older children enjoy making intricate designs with paper looping and spiraling in many directions. 2. Peek-A-Boo Patterns: Give each child a piece of neon construction paper. Cut out a variety of random shapes from scrap neon paper. (Older children can cut out their own shapes.) Provide a number of hole punches so children can punch holes in the paper shapes. Children glue paper punched shapes onto their piece of paper. The holes create unique Peek-A-Boo designs. 3. Sparkle Chains: Instead of making red and green chains for Christmas, decorate the room with some bright colored chains. Cut neon paper into strips 3" by 8". Ask children to decorate strips with assorted stars, sequins and neon paper scraps. Staple or glue the strips to form a chain. This can be an ongoing project where children add to the loop daily until it stretches around the room. 4. Loopy Flowers: Cut neon paper into strips 2" x 8". Show children how to make a loop with the paper and glue the ends together. Each child should have 4-5 paper loops. Cut out circles about the size of golf balls. Glue the paper loops to the center of a circle like the spokes of a wheel. Glue another circle on top so you have a "flower sandwich". 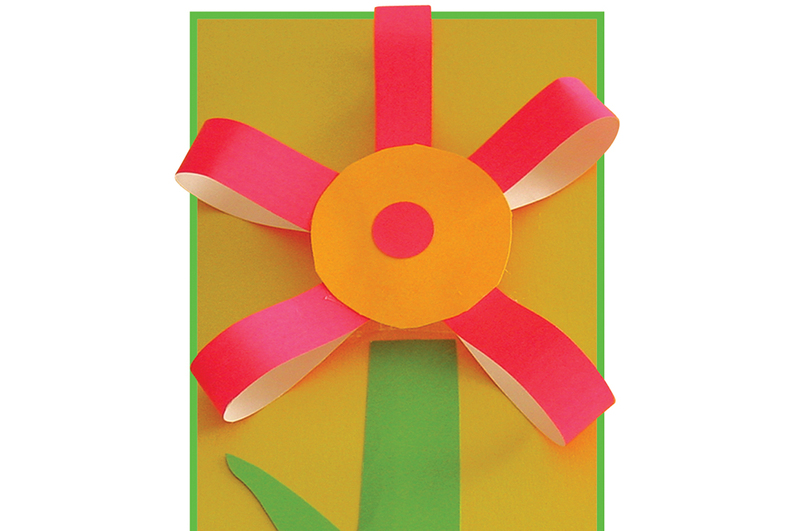 Now simply glue the flower to a piece of construction paper. Add another paper strip for the stem or use markers to draw leaves and stem. 5. Happy Headbands: Bright colors make people happy! Cut 8 1/2" pieces of neon paper into thirds, lengthwise. Staple or tape two strips together to make the headband. Let children decorate their headbands with all sorts of sparkly supplies. Use sequins, stickers, neon paper scraps and shiny buttons. Add strips of neon-colored surveyors tape to the back to give movement when children run wearing their headbands. Show children how to wrap thin strips of paper around a pencil to form paper antennas. After the headband is decorated, have an adult measure the strip around the child's head and staple the ends. 6. Aluminum Masterpieces: Many children have never painted on aluminum foil. Give each child a section of foil along with various colors of paint. When finished painting, add some shiny mosaics or sequins directly to the wet paint. They'll dry and stick to the foil. You'll have shiny designs on shiny paper. 7. Kool Kites: Cut a piece of neon construction paper into a kite shape. Save leftover pieces to use as decorations. Set out an assortment of stickers and sequins to decorate your Kool Kite. Attach an 18" strip of surveyor's tape to the back to look like kite string. Display on a wall for high-flying decorations. 8. Heart Mobile: Cut neon construction paper into 2" x 8" strips. Tape two pieces together to make a long paper strip. Have children decorate their mobile strip with stickers and sequins. On the back side, glue 6-8 strips of surveyor's tape in various lengths. Encourage children to be creative in decorating the surveyor's tape. They can use markers, stickers or add paper hearts at the end. When the decorating is complete, staple the paper strip into a circle. Punch two holes in the top and use surveyor's tape for hanging. 9. Firecracker Picture: Here's any easy project for young children. Pass out pieces of dark blue or black construction paper. Cut an old Mylar balloon in strips and glue to the paper, representing fireworks. Add star stickers for a great holiday picture. 10. Sturdy Shakers: Cover a 4"–5" cardboard tube with neon paper. Staple one end shut. Add 1 tablespoon uncooked rice or popcorn. Here's the tricky part… Twist the open end in the opposite directions as the stapled end. This gives you a firm basis for your shaker. Cut several 8" pieces of surveyor's tape. Stick the ends inside the twisted tube and staple shut. Let children decorate the shaker with stickers and bright-colored paper scraps. Use the shakers for a variety of music and movement activities. 11. Bright Gumballs: Draw an outline of a gumball machine on a piece of neon paper. Let children use markers to decorate the base and top. Cut a small rectangle and glue to make the flap where gumballs come out. Use bright-colored round stickers to fill up the gumball machine (available in office supply stores). Ordinary craft projects take on a new dimension simply by using neon paper and some extra shiny glitter, foil and stickers! Silvana Clark has over 20 years experience helping thousands of children create arts and crafts projects and presents keynotes and workshops on a variety of recreation related subjects. Silvana can be reached at (615) 662-7432 or Silvanac@msn.com.